Prepared by; Mr Mustafa Gogcu. Ice and ready-mix concrete plants are two indispensable elements in hot areas and important projects. When the temperature reaches approximately 50° C, such as the middle east regions, the production and casting of concrete can be a problem. In fact, exceeding the ideal concrete temperature of 32° C reduces the quality of concrete and affects the quality of the work. The concrete, which is especially used in high-priority buildings such as dams, highways, hospitals and bridge constructions, is forcing to be implemented under supervisory institutions below 32 ° C. If the concrete temperature exceeds 32° C, production is immediately stopped and the use of this concrete is not allowed. In these cases, controlling the temperature of concrete constitutes a condition for the continuity of the work. There are various methods and applications to control the concrete temperature. 1- Using chiller (Water cooler); To reduce the water used in concrete to 8-10° C. This reduces the concrete temperature in the range of approximately 4-5° C.
2- Use ice-water (Max water cooler); By decreasing the water used in the concrete up to 0,5° C, the concrete temperature is reduced by approximately 7-8 ° C.
3- Using Ice Machine; Adding ice to the concrete mixture allows maximum temperature to be reduced. This application provides about 12° C decrease in concrete. 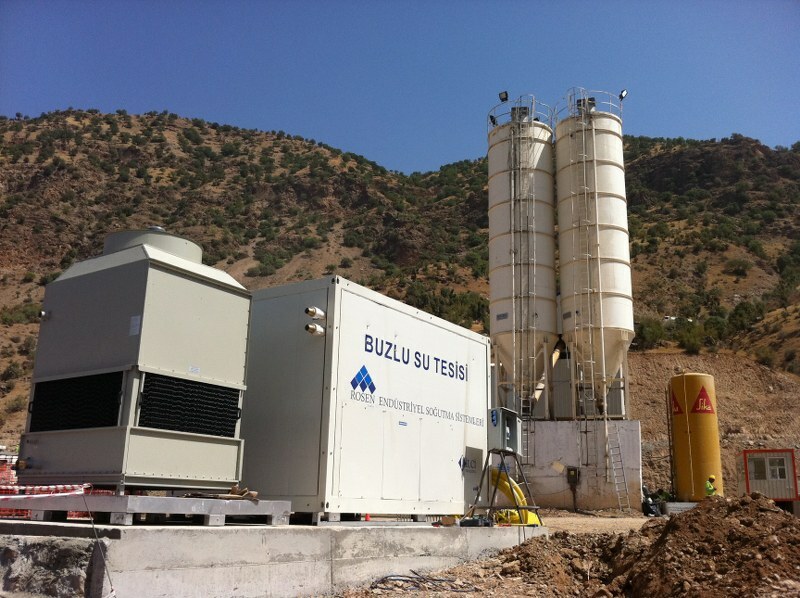 4- Aggregate cooling system; It is an application that provides maximum temperature drop in concrete by cooling the aggregate used in concrete. With this method, approximately 20° C reduction in concrete can be achieved. Apart from these, the concrete temperature can be controlled by some measures to be taken at the construction site. For example, by protecting the cement silos from sunlight and even by reducing the temperature by the irrigation system around the silo. In addition, the surface of the aggregate is covered and protected from the sun's temperature. These methods can be seen as simple but every measure that will reduce the temperature of the concrete every 1lıC will have a big effect. In some cases, these methods cannot be the only solution. The most commonly used applications is primarily to use low cost Chiller. As we mentioned above, if the temperature of the concrete is lowered by 4-5 ° C, this application is the lowest cost. However, if it is necessary to make a decrease in concrete more than this temperature, Ice-Water technology is required. However, if the temperature of the concrete is not sufficient, the Chiller Unit and Ice Plant should be used together. In this case, concrete can be reduced by 25 points. As a member of the Rosen team, I have prepared this article based on years of field experience. I hope it can be useful for those who read it and those interested.